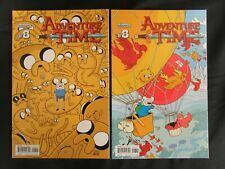 LOT of 2 2012 Adventure Time #8 #9 Cover B Boom! ADVENTURE TIME 1-47 KABOOM LOT 51 COMICS A & B FINN JAKE VARIANT 2012 NM NEW!!! Adventure Time With Finn & Jake #1 Kaboom! 2012 3nd Print Rare! LOT of 2 2012 Adventure Time Marceline And The Scream Queens #3 #4 Cover A Boom! This page was last updated: 20-Apr 20:39. Number of bids and bid amounts may be slightly out of date. See each listing for international shipping options and costs.